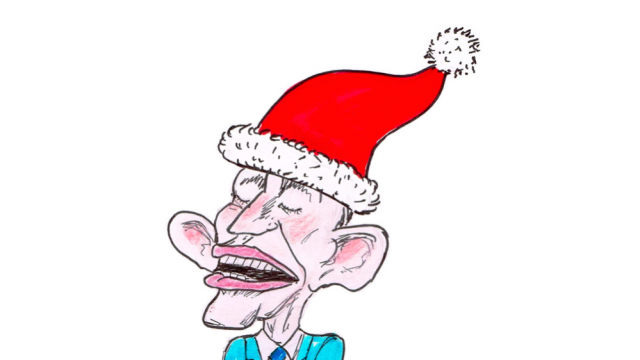 With Tony Abbott refusing to leave the party, Roger Pugh retells his modern day fairy tale about PM Scrooge and the Night before Spillsmas. Suddenly there was a blinding flash of light and Scrooge awoke to find Peter Costello standing at the bottom of his bed. “I am the Ghost of Prosperous Christmases Past,” announced Peter. Not two hour later another blinding flash of light announced the arrival of Julia Gillard. “I am the Ghost of Carbon Reduced Christmases Present,” announced Julia with gusto. Just an hour later there was a flash of light even more scintillating than the previous two and Scrooge awoke to the presence of Malcolm. “I am the Ghost of Prosperous Christmases Future,” announced Malcolm grandly. “Alright you can come in now guys,” called Malcolm. And with that fifty-four members of the Coalition parliamentary party filed into Scrooge’s bedroom. “Bah humbugger me,” said Scrooge. “God bless us one and all,” said Tiny Tim Flannery. Following a career that comprised heading up global marketing departments and advertising agencies Roger made a seachange to his hobby of humorous writing by co-founding Political Satire site, Friday Mash. Roger is now the Native Content Director, heading up The Big Smoke’s Creative team and a regular political columnist in both Australian and USA editions of The Big Smoke.